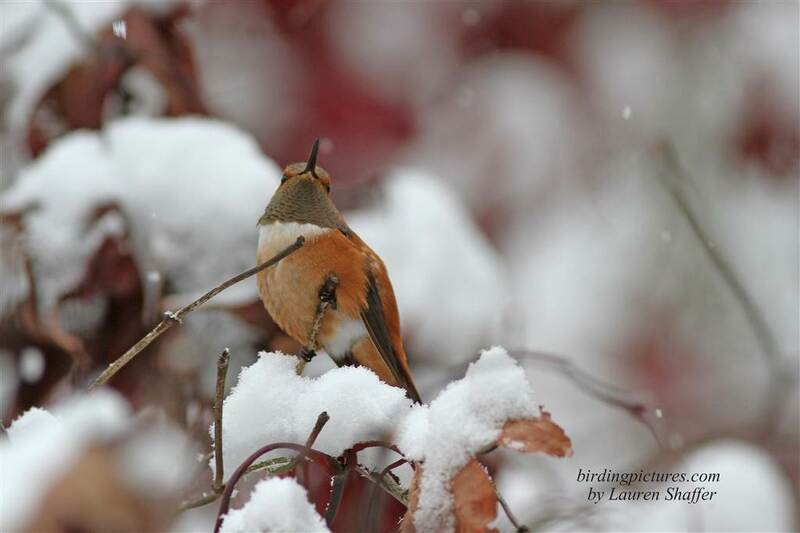 In my wildest dreams I never thought I’d be photographing a hummingbird in the snow! This Rufous which made its way westward to our Central PA area instead of south for the winter, is just one of many PA hummers this fall. East of the Mississippi, the only hummingbird species that we have is the Ruby-throated which is unable to overwinter in the cold. There are three reasons for this. It lacks the ability of Western hummingbirds to achieve torpor (drastically lowering its body temperature at night,) the ability to accumulate body fat, and to be adept at catching insects and spiders in the cold. This adult male sitting in the snowy branches is the same bird that showed up in mid-August that was blogged about in PA Rufous Hummingbird Banding. The homeowner has been very gracious to give every consideration to this beautiful tiny bird, and to allow local birders to photograph it. Because the sugar water freezes at about 27 degrees, she has provided a heat lamp close to one of the feeders on the porch. 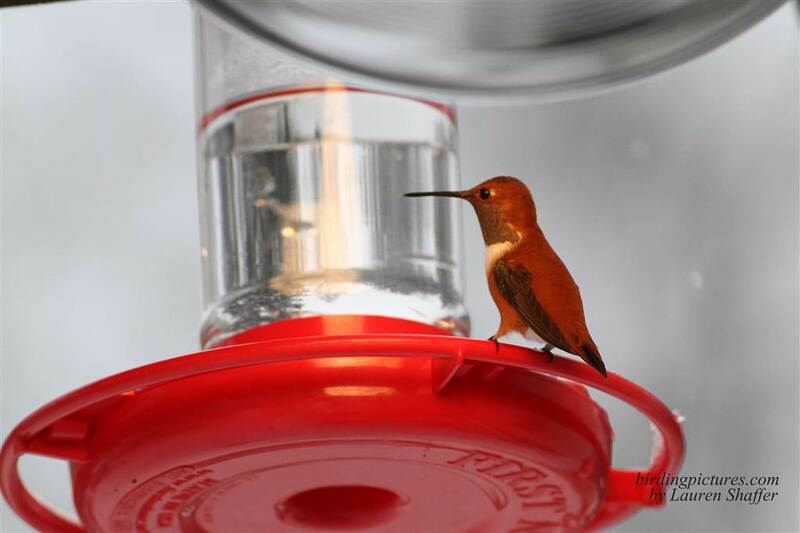 The hummer came twice in the short time I was there, feeding from the side of the feeder closest to the heat lamp. It then perched in the nearby tree which still had leaves on it, providing some shelter. Even though the wet snow came down most of the day, this tiny bird seemed the picture of health and I hope it stays the winter! 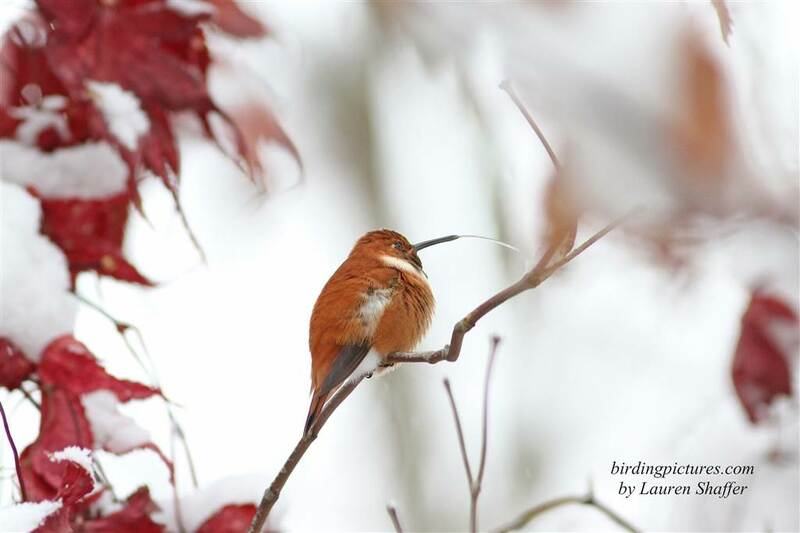 For more information on Western hummingbirds and how to make a heat lamp for a winter feeder see Hummer/Bird Study Group. 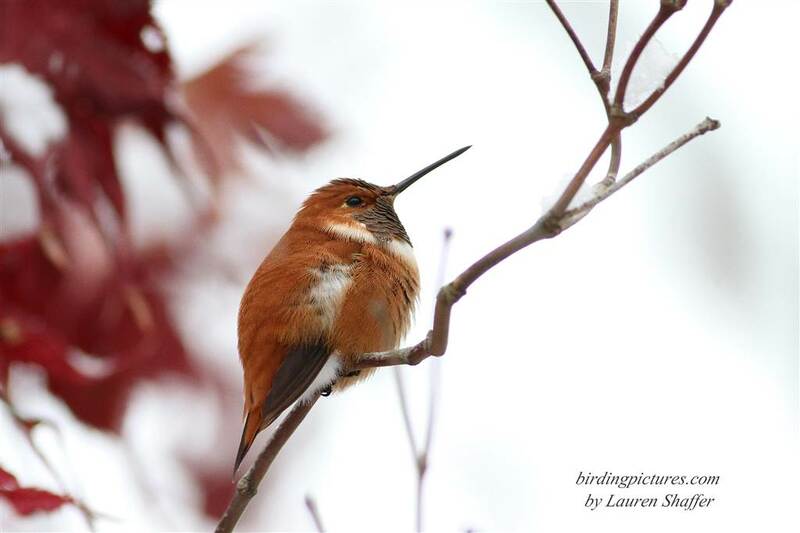 Other blogs about wintering vagrant hummingbirds are Hummingbird Migration–Leave a Feeder Out!, and Stokes Birding Blog, Calliope Hummingbird in NH. What magnificent pictures, Lauri. Thanks so much. I’m so glad you enjoy them, Anna. I’m curious to know which hummingbirds winter in your part of Texas? Do you have Rufous there? 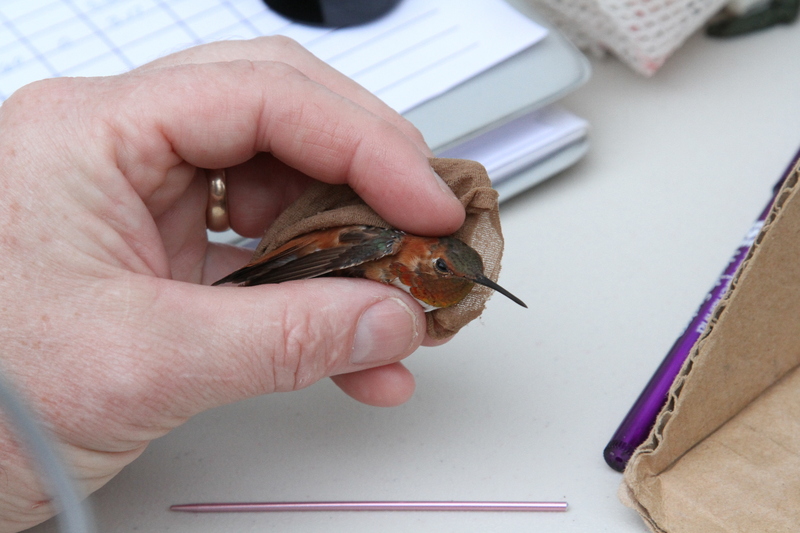 Yes, we have mostly Rufous. We are a little west for ruby throat, but do get them during migration. Sometimes (rare) the tropical wander in but they don’t stay on our hill. Great pictures! What do hummingbirds eat in wintertime? It is unbelievable that such small birds can resist the coldness! 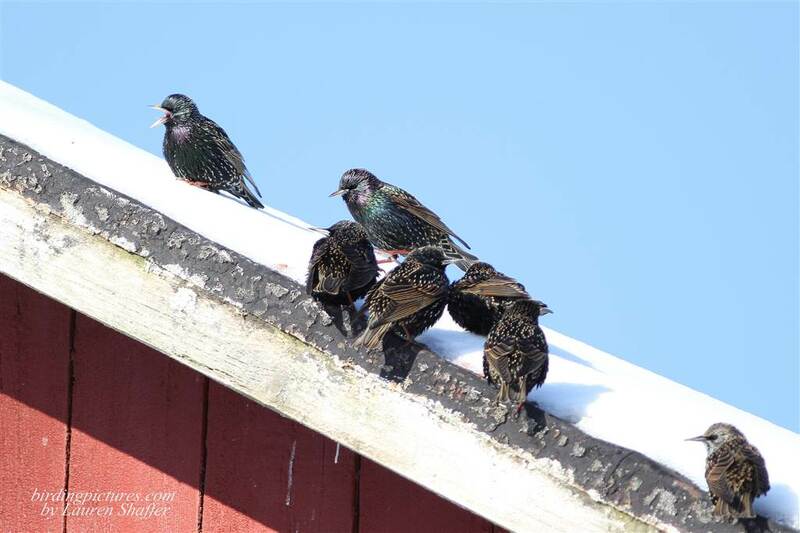 Yes, it is unbelievable that they can survive the cold, but with being able to decrease their body temperature, and feeding on insects and hummingbird nectar, they do quite well! Hi, Sue! These were taken in Watsontown, PA. In fact the bird is still there. Because PA has hosted many Western hummingbirds this fall, and the numbers seem to increase every year, it’s a good idea to keep them up into November and keep an eye on them. If you check on eBird, you’ll probably find wintering hummers in your area that you could visit!